Christmas or Yuletide and New Year are connected to very old traditions and important celebrations in Norway. Keep in mind we are on top of the northern hemisphere. After a long period of darkness and cold, no wonder people needed a break and celebrated “the return of the sun” – with wild feasts that lasted for days. These traditions are all based on folklore and myths since the return of the sun has an important influence on our daily life and calls for special celebrations. Imagine: In our capital Oslo (latitude of 60° North) right now has 6 hours of daylight with the sun really low on the horizon at midday, compared to 19 hours and hardly no dark at all at summer solstice. Most everyone has either a spruce or a pine tree in their living room – decorated with white lights, tinsel, Norwegian flags and other ornaments for Christmas. As a child and with my children of course, we made paper baskets of shiny, colored paper. The baskets can be filled with candy or nuts. Chains made of colored paper are also very popular. To see a tree decorated outdoors is a new thing, but also more and more common. To the right in the pic, you see my parents tree on their balcony. Notice the bowl with Christmas porridge at the bottom and beside it: The Yule Log painted as a Nisse (more details below!). For thousands of years we have developed our food preservation traditions and our folk tales have over time become mixed with other European folklore, like for example Santa Claus (Nisse). All of this comes to mind when visiting my parent’s home for the Christmas Day smorgasbord. The house is filled with Yuletide spirit, decorations and food traditions which have been in our family for generations. Counting about 15 people, there is always a lot of food left, so join us, sit in and enjoy my childhood’s food feast memories in the photo. There will be served e.g. Ham, Pork Ribs, Tongue, Roast Beef, Lam Roll & Lever Pate and of course Salmon & Herring. Remember all these are homemade with fresh meat coming directly from the butcher – made with love and care, based on recipes past on for generations! Just by thinking of it, especially when I enter my parents’ house this special day, I am literary taken down the memory lane – just by closing my eyes. I remember mom and grandma in the kitchen almost the entire month of December; the smell, the atmosphere, the excitement and the anticipation. There was something in the air – it was Christmas – the most wonderful time of the year! If you thought the food and the feast ends here, you are wrong! No, when you are filled up with pork and lamb and ham and maybe had a short walk or a power nap to digest at least a bit, then the special homemade sweets were on the table. Typical it would be the home made marzipan served in a very old confect box and of course the Ring cake (in Norwegian, Kransekake). A Nisse is a mythical creature of Scandinavian folklore originating from Norse paganism – actually close to what we call an elf. He was believed to take care of a farmer’s home and children and protect them from misfortune, especially at night, when the house folk were asleep – type Fjøs Nisse (Fjøs = barn). Nisse is the common name in Norwegian, Danish and the Scandinavian dialect in southernmost Sweden is Tomte and Tonttu in Finland. He was often imagined as a small, elderly man (size varies from a few inches to about half the height of an adult man), often with a full beard; dressed in the everyday clothing of a farmer. However, there are also folktales where he is believed to be a shape-shifter able to take a shape far larger than an adult man, and other tales where the Nisse is believed to have a single, cyclopean eye. In the 1840s the farm’s Nisse became the bearer of Christmas presents in Denmark, and was then called Julenisse (Yule Nisse). 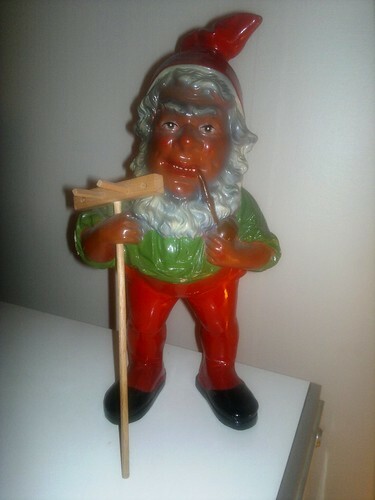 This mythical character then turned into the white-bearded, red-capped friendly figure associated with Christmas ever since. Shortly afterwards, and obviously influenced by the emerging Father Christmas traditions as well as the new Danish tradition, a variant of the Nisse, called the Julenisse in Norway and Jultomte in Sweden, started bringing the Christmas presents in instead of the traditional Julbock (Yule Goat). Ihope you have enjoyed my reminiscing of my childhood and a walk down memory lane. Christmas Eve is now upon us and its time not only to remember our traditions but to give them to our own children and families. From all of us here to all of you: Merry Christmas and a Happy New Year!